Freezing cold temperatures be damned. Even in the winter I’m a smoothie drinker. They’re so handy for getting in a few veggie and fruit servings for the day in a portable, sippable package. And if you play your cards right, you can add to that a healthy dose of protein before you even leave the house. 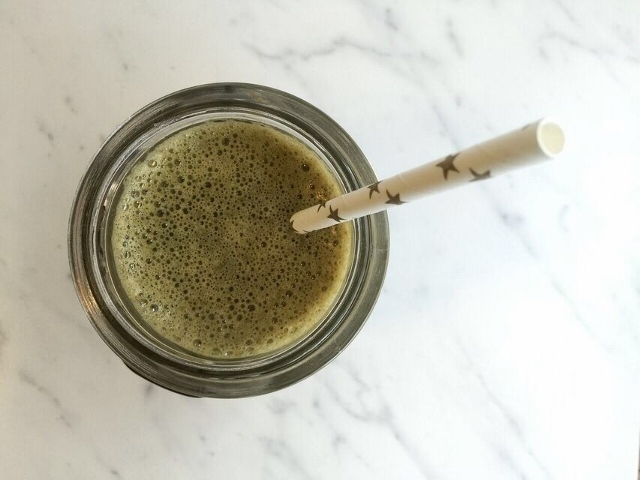 I’m always testing new smoothies from my favorite blogs, but there are a handful of tried and true recipes that have stood the test of time in my blender rotation. 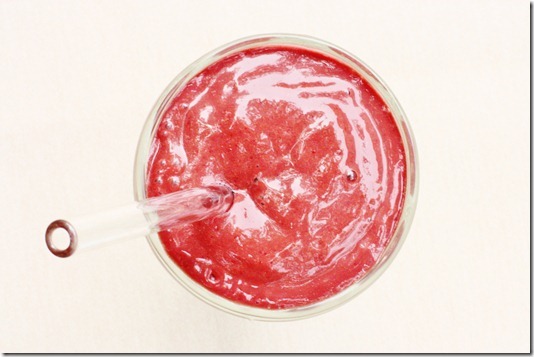 It may seem simple, but perfecting a smoothie is a tough business. My latest 4 attempts at concocting a Peppermint Green Tea smoothie in my own test kitchen have come up short. And bland. Definitely nothing worth posting to the blog just yet. In the meantime, I’m sharing a carefully curated list of successes with you today from the experts, in no particular order. 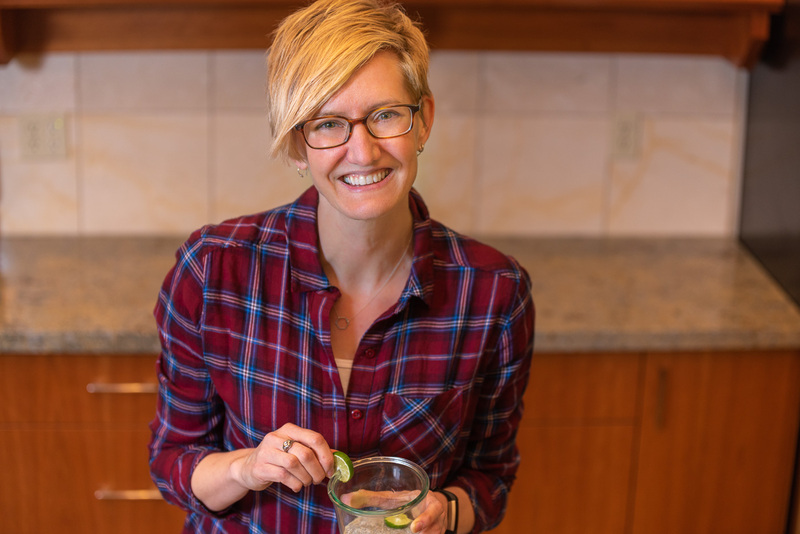 I rarely make any modifications to this one; it’s perfect as is…except that she calls it 2 servings and I drink the entire recipe’s 364 calories on my own. No sharing. 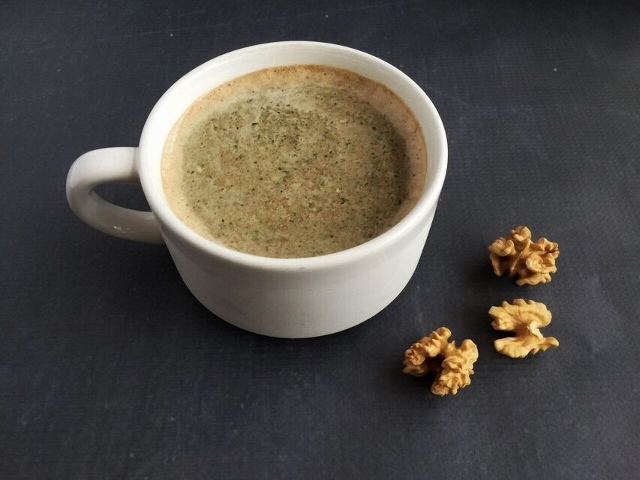 I’ve had good luck with almond milk, as suggested, but have also subbed soy and hemp milk with success. And I opt for hemp seed over chia seed because I like the final texture better. Thank you, Gena Hamshaw, for creating a smoothie recipe that got me to eat avocado. Not just for breakfast even. I mean ever. It helps my dietitian street cred to be able to say I enjoy eating this healthy source of monounsaturated fats. This recipe is resilient, so I’ve made many frantic early morning substitutions when I realized I didn’t have all the right ingredients, and was still rewarded with a frosty, fruity treat. For example, you can play around with the mix of berries and cherries and use raspberries and/or cranberries. I use whatever greens are in the fridge, which is more commonly kale or spinach for me than romaine or baby bok choy. And since I don’t keep stevia around, I opt for 1-2 tablespoons of maple syrup. I’ve got a few nips and tucks for this recipe. I usually cut it in half, but add a handful of spinach and something to sweeten it up a bit, since I use unsweetened coffee. A tablespoon of brown sugar or 1 date usually does the trick. And this creamy, frozen goodness requires a little advance planning since you need not 1, not 2, but 3 different kinds of ice cubes. If you fill your trays with coffee, water, and milk the night before, the “shake” comes together quickly in the A.M.
As a dietitian, I’m not a fan of the word “detox” since there isn’t agreement on what it means or how to accomplish it with food or if it’s even necessary. 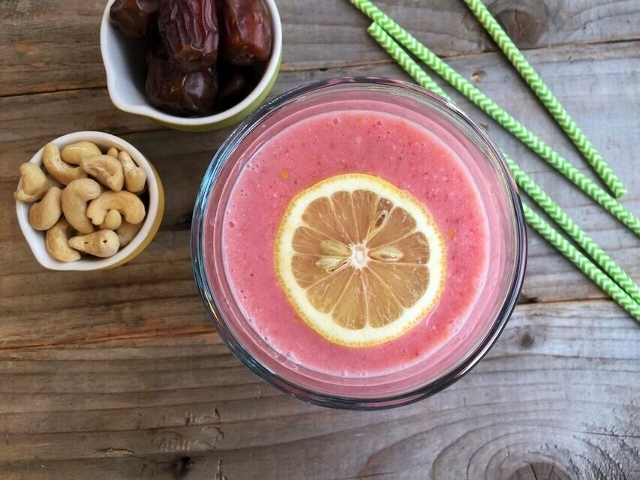 So I make no claims that this smoothie does anything special for you…except taste delightful. Again, I’ve tweaked it somewhat based on my own weird preferences and regular kitchen staples. 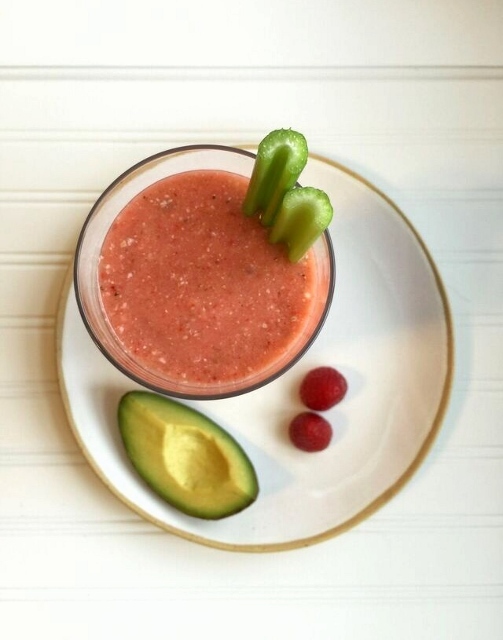 I do some version of a half recipe to keep the calories under 400, use coconut butter or manna (which includes the coconut meat) instead of coconut oil, use frozen avocado and frozen strawberries, add a splash of maple syrup, always use the apple, and sometimes skip the beet. And I throw in a tablespoon of hemp seed to bump the protein up 3 more grams. 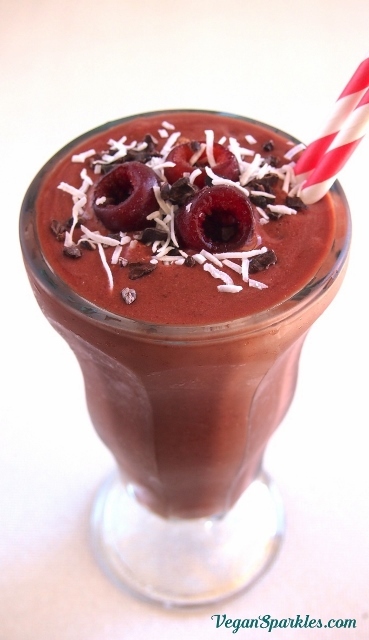 Cherry Ripe is a kind of candy bar full of cherries and coconut and covered in chocolate. Sounds like a genius combination, don’t you think? It works well when you throw all these ingredients in a blender, too. I usually whiz it up, check the consistency (as it often runs thick), then add water or more milk to thin. Sometimes my non-high-speed blender leaves chunks of date, but I consider them a tasty, chewy little treat at the bottom of my glass. This recipe doesn’t need much modification at all, for me anyway. The only alteration I make is to replace the coconut water with soymilk to up the protein contribution. And as she notes, the recipe makes 2 servings, so I cut everything in half to make a portion for 1 person. I actually pump this one up to 1.5x the amounts listed and it still runs only about 300+ calories. It’s more common that I’d have a bag of sliced almonds on hand, so I generally use those instead of whole ones. And I use either Starbucks Via Instant Iced Coffee (sweetened) or just the cheap store brand of instant coffee (unsweetened). If needed, instead of stevia I use 2 teaspoons of sugar, but I bet it would be great with maple syrup as well. 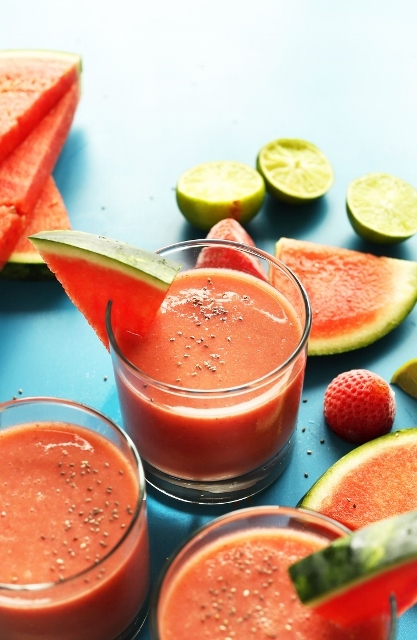 Aim for 300-400 calories for a single morning smoothie, which is filling enough while still leaving room for calories spent at lunch and dinner. Maximize protein whenever possible, since when our glasses are full of just bananas, coconut water, and celery it’s the nutrient that often needs boosting. Nuts and seeds can fit the bill quite nicely. Try to get a fruit and a vegetable whenever possible. And remember that whole, blended fruit and vegetables are preferable to the juiced versions. 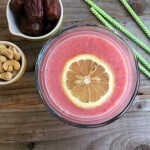 The beauty of writing this post was that I made and photographed a bunch of smoothies on one rainy Sunday afternoon. Now I’m set for a while. My freezer and fridge are stocked with jars and jars of healthy fats, antioxidants, fiber, and plant protein, which means an ice-cold breakfast will be ready and waiting even when the December temperatures dip towards 32. Got any blendable, drinkable suggestions I should add to my list?